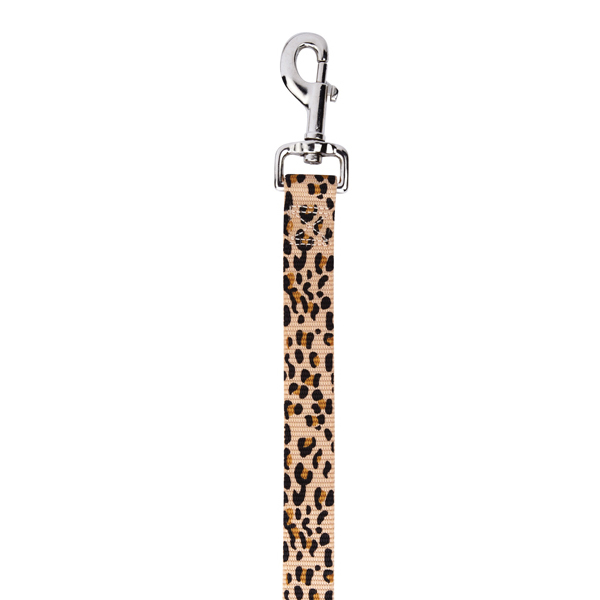 Let your pup take a walk on the wild side with this fashionable and durable Cheetah Animal Print Dog Leash by East Side Collection. East Side Collection Animal Print Dog Leads are simply wild! Made of strong and durable nylon. Features a cheetah pattern with a nickel-plated swivel clip. The perfect accessory for a fashion-forward pooch. Look for our matching Cheetah print dog collar, sold separately. Posted On 03/11/17 by Brenda V from Thomasville, GA Yes, Brenda V recommends this product! I wanted a shorter leash for my aggressive Chihuahua when I take her with me in & out of stores. This works well for me as I can pull her in closer to me when she spots another dog. It's strong & well made with a very nice sturdy clip. It matches her tan coat and her leopard print fleece outfits. I wanted a thin leash under 3/4" & this measures in between 1/2 & 3/4". Can't beat the price! Posted On 01/16/17 by Chelsey F from , Yes, Chelsey F recommends this product! Love love love this print however the collar and leash don't match exactly. One is a little lighter brown than the other! Still looks good though! Posted On 09/29/16 by Holly K from Berwyn, IL Yes, Holly K recommends this product! Its so nice to be able to order a leash and collar that match so well. You can be sure I will be ordering more things in the future. Bought this & the collar for my little shorkie Itty Bitty & it looks so good with her coloring. Posted On 06/20/16 by SARAH M from LONDON, Yes, SARAH M recommends this product! My second one! Love it! I bought two of these because I use it so much. Very cute. Matches lots of different colored harnesses. It's my favorite! Posted On 09/26/15 by Pamela A from Killington, VT Yes, Pamela A recommends this product! As with everything I've purchased here, this leash is well made and beautiful. One problem is that it is much heavier and wider than I expected. I bought it for my new baby Abyssinian Cat. It weighs almost as much as he does! lol I called and spoke with Chanel and she was sweet and even looked in the back to see if they had any smaller versions. They didn't but she promised to let me know when the get some in. She reminded me that I have ONE YEAR to return it. What a nice company! Posted On 06/22/15 by Karen F from Newnan, GA Yes, Karen F recommends this product! Really nice weight & well made and sturdy clasp. Bought this to go with the leopard print harness and it matched -- love having everything matching :-). Posted On 12/10/14 by marilyn C from , GA Yes, marilyn C recommends this product! Goes with the cheetah collar I bought for my little rescue Yorkie girl Itty Bitty. Very pretty! Posted On 11/11/14 by Sally D from , FL Yes, Sally D recommends this product! I am excited to get my order.